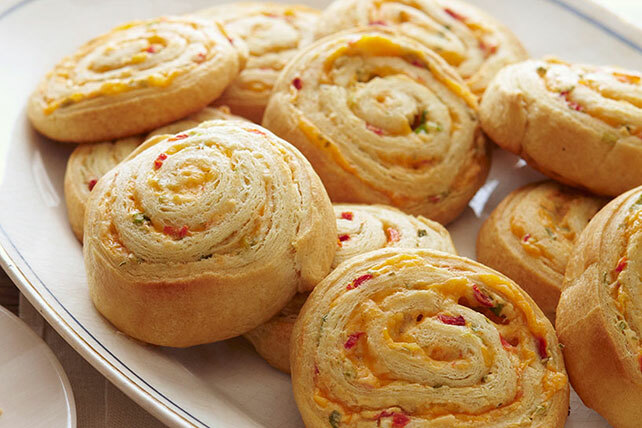 Bring the heat to your next party with our Pimento-Cheese Pinwheels! Sharp cheddar and a dash of hot pepper sauce make this appetizer a fan favorite. Beat all ingredients except crescent dough with mixer until blended. Unroll dough onto work surface; firmly press perforations and seams together to form 12x8-inch rectangle. Spread with cream cheese mixture; roll up, starting at one long side. Cut into 16 slices. Place. 2 inches apart, on baking sheet sprayed with cooking spray. Bake 13 to 15 min. or until golden brown. Serve warm. Prepare using PHILADELPHIA Neufchatel Cheese, KRAFT 2% Milk Shredded Sharp Cheddar Cheese and reduced-fat refrigerated crescent rolls. Substitute roasted red peppers for the pimentos.